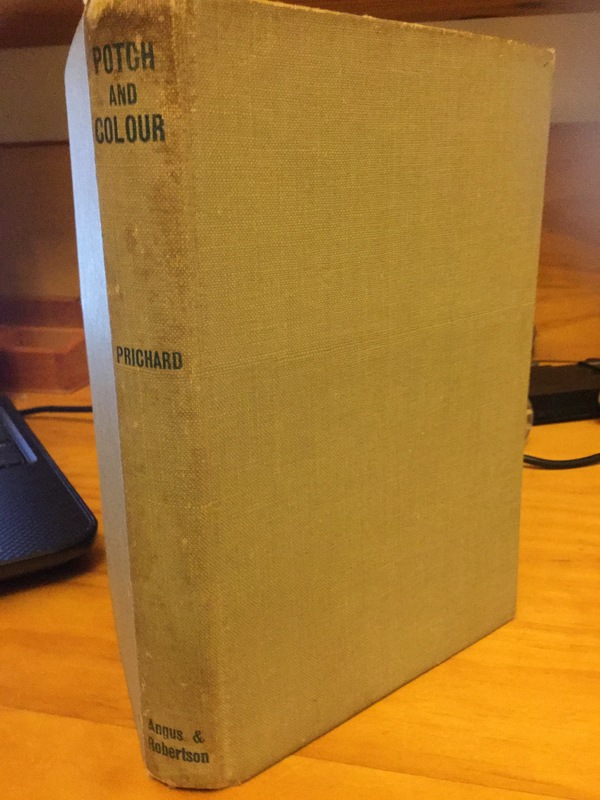 Here’s my slightly tatty copy of Potch and Colour, Katharine Susannah Prichard’s 1944 collection of short stories. It’s the only copy I’ve ever seen – it’s not particularly rare or valuable, but it shows up less often than her better known books. I found this copy serendipitously in a secondhand booksale run by the library where I work. I wish it had the beautiful dust cover I have glimpsed at low-resolution in an antiquarian bookdealer’s catalogue (right). Katharine wrote some incredible short stories. I would go as far as to say that I think the form suited her better than the novel, even if she is not as remembered for it. This collection mainly includes stories originally published in journals after her first collection, Kiss On the Lips (1932), but the first appearance of some of them still needs to be established. One story, at least, is quite early – “The Bridge”; I found a newspaper copy of it on Trove from 1917 (unfortunately, it’s not one of her “incredible” stories; but it’s here, if you’re interested). This collection divides into two types of story – goldfields “yarns” and the more substantial, realist stories, several of them about Aboriginal characters. The yarns are old-fashioned and entertaining enough with flashes of inspiration. 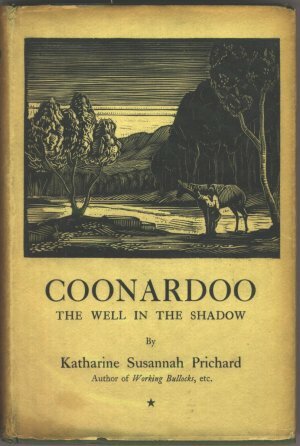 They point the way to The Roaring Nineties, the first novel of the goldfields trilogy, which Katharine was already writing when Potch and Colour was published. But it’s the other stories which impressed me. There’s three particularly worth commenting on. The second is “Flight,” a story which begins with a police officer charged with removing three “half-caste” (sic) Aboriginal children from their families. He doesn’t particularly agree with their removal, but his strongest feeling is not about the injustice so much as the embarrassment in the eyes of the locals as they watch him ride his horse with the girls. When he arrives at his house, the point of view shifts to his wife, who feels compassion for the girls, but of a very narrow kind – she feels strongly they shouldn’t have their hands tied for the night and sneaks out to untie them, telling them she’ll come back first thing in the morning to retie them. And then the point of view shifts to the girls themselves and the options that face them, untied as they are. It’s a traditional, beautifully crafted story which is devastating and prescient in its critique of the Stolen Generations policy. The third is “Christmas Tree,” a poignant portrait of failed wheat farmers in Western Australia in the Depression. It’s one of the occasions Katharine gets the balance right between her politics and aesthetics, as she reveals the injustice of the banking system not didactically but through the eyes of one of its victims. Perhaps her husband Hugo’s failure as a farmer before World War One fed into her account. My supervisor Tony Hughes-D’Aeth tells me this story gets a mention in his literary history of the WA wheatbelt, forthcoming from UWA Publishing. Katharine’s stories are not in print at the moment, though several “best-of” collections have been published – the ones containing just her short stories are Happiness, published in 1967, two years before she died, and Tribute (1988), selected and edited by her son Ric Throssell. Rather than a new selection or a reprint of one of the old collections, I think the best thing for the future would be a collected stories edition. It could showcase her development as a writer and the themes which preoccupied her over different periods and show how substantial her body of short fiction is.